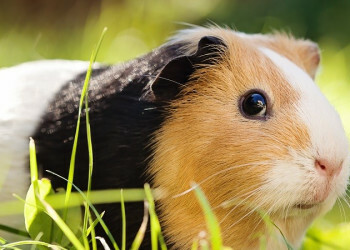 Guinea pigs can make a variety of noises, and knowing what they mean can take some working out. Here's our guide on understanding your piggies language! Wheeking or squealing: this sounds like a long, high pitched whistle, or squeal, and usually represents excitement. Your piggy is likely to make the noise when she sees you preparing food for her, or if she knows it's playtime. Chutting: this sounds a bit like a frog’s croak, but softer. It generally means that your Guinea Pig is happy going about her daily routine. Rumbling: also known as rumble strutting and motor-boarding this is a rumbling noise and a mating sound. Males will make it to attract females and a female will make it to let nearby males know she’s in season. Females do come into season quite regularly, around every 16 days. However, within that time, she’ll only be interested in mating for around 8 hours. Rumbling or rumble strutting is a sound that Guinea Pigs will make as part of their mating ritual. Purring: this can mean your Guinea pig is happy or angry, so you’ll need to look at the context of the situation carefully. 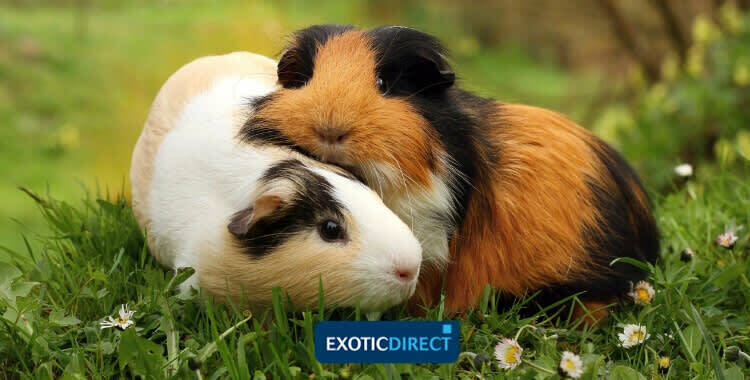 A contented Guinea pig will make a low purring sound, whereas an annoyed piggy may make a more high pitched purr, with this increasing in pitch towards the end. She may also vibrate a bit as well. Purring may also indicate fear, if it’s very short, and your piggy is motionless. Teeth chattering: This doesn’t mean your Guinea pig is cold, and is in fact a ‘back off’ signal, warning other piggys and people to stay away. The chattering may also sound like a hissing noise. You may find a fighting guinea pig makes this noise, accompanied with the bearing of its teeth. Chirping: This sounds exactly like a bird and could easily be confused with a stray wild bird in your house. However, the sound is very rare, and is thought to indicate fear. However, this isn’t confirmed, and confusion still surrounds its meaning. 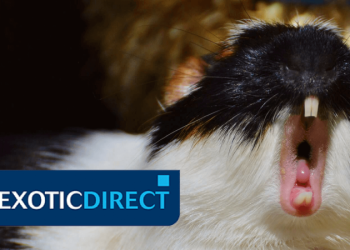 Complaining or moaning: It’s thought Guinea pigs make the noise when they want some personal space, or to tell other piggy’s or people to back off. It sounds a little like low pitched version of a record being scratched. Shrieking: This high pitched noise means your piggy is really upset, frightened or scared. Don’t ignore it, because your piggy wouldn’t be squeaking for nothing. Check for things like physical injury and check its immediate surroundings, in case something nearby has frightened it. Hissing: Your piggy will make this sound as a warning sign, and to tell other Guinea pigs or humans to back off. Cooing: This is a sign of affection, and Guinea pigs will do it for humans they love and for their babies. Sneezing: A high pitched sound, it sounds just like a sneeze. But Guinea Pig sized. Usually its nothing to worry about, however, if your piggy has signs of a cold you’ll need to get it checked by a vet. Symptoms can include runny eyes and nose, heavy breathing and coughing, a crackling sound from its chest and half closed eyes. Your piggy may also have other symptoms. Sneezing can also be caused through allergies. Consider whether you’ve changed your Guinea pigs washing powder recently, or if any room scents or deodrants have been used near your piggy. Aspen and pine bedding can also cause allergies. You’ll need to work out which item has caused the allergy – so over a period of a few weeks try removing items one by one from your piggys home. You’ll then be able to monitor your Guinea Pig's reaction when these items have been removed. Dusty hay can also cause sneezing, so you should always try and buy the low dust variety. 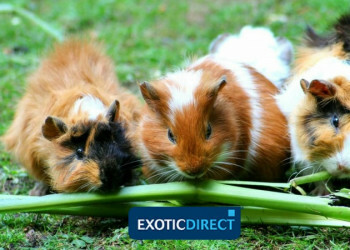 Breathing fast: Guinea pigs should breath quietly, and because piggys are a small pet, their breathing will be quicker than ours. However, if your piggy is struggling to breath, it could be a sign of a respiratory infection. You should always visit the vet if you suspect it could be this. Guinea Pig’s can get very ill very quickly, so its important you don't wait. Stomach noises: As Guinea pigs digest their food, a by-product of gas can be produced, resulting in strange noises. Your piggy should be able to pass this easily. However, strange tummy noises can also be a sign of illness, such as Gut Stasis. This is a life threatening condition and occurs when the gastrointestinal tract stops moving. Symptoms can include a bloated tummy, loss of appetite, hunching over, constipation, or a significant reduction in pooping and poor fur condition. This occurs because your piggy doesn’t feel well enough to groom herself. Gut Stasis can be caused by a lack of fibre in your Guinea Pig's diet. An indication of this can be overgrown teeth - which will have grown because they haven't been ground down by chewing fibre. If you suspect Gut Stasis at all, you should visit the vet immediately. Find a vet near you. Brooks Braithwaite (Sussex) Ltd is authorised and regulated by the Financial Conduct Authority (FCA), our FCA register no. is 304839. www.fca.org.uk/register. If you are unhappy with our service we have a complaints procedure, details of which are available on request (by telephone or email). You may be able to refer a complaint to the Financial Ombudsman Service (FOS) if you are unhappy with how we deal with your complaint. The FOS website is www.financial-ombudsman.org.uk/. © 2016 Brooks Braithwaite (Sussex) Ltd.